Hanoi (VNA) – Hanoi officials exchanged experience in various fields with the administrations of Bulgaria’s Sofia and Portugal’s Lisbon while visiting the two European capital cities from August 5 to 10. 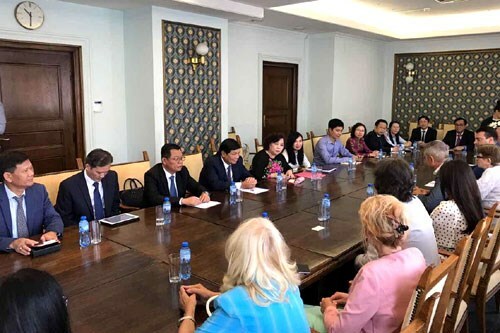 The delegation, led by Chairwoman of the municipal People’s Council Nguyen Thi Bich Ngoc, visited relic sites and museums in Sofia to learn about preservation of relics and urban planning. At a meeting with the investment and equitisation agency of the Sofia municipal council, the two sides introduced their respective cities’ strengths. Vice Chairman of the Hanoi People’s Committee Nguyen Quoc Hung lauded Sofia’s economic, social, tourism and health care development, adding that he wants both sides to bolster cooperation in all aspects, particularly tourism, health care and construction. On August 7, Chairwoman of the People’s Council Ngoc met with Sofia officials led by Chairman of the City Council Kaloyan Pargov. The two sides shared experience in running municipal councils and committees, as well as these agencies’ functions in local socio-economic development tasks. Ngoc said her delegation’s visit to Sofia aimed to exchange experience in operating local administrations and to promote tourism cooperation. They agreed to make mutual visits, boost the popularisation of the cities’ tourism potential and organise cultural days in the future. Hanoi and Sofia will step up investment promotion to call for more Bulgarian businesses to invest in Vietnam and its capital city, and suggest Vietnamese investors enter the light industry and construction and health care sectors in Bulgaria, they agreed. They will also enhance cooperation in education and training, especially vocational training, and further share experience in ensuring security.